Whether you need someone to come by and feed your cat while you're away, or you're looking for a cat sitter that will let your cat stay at their home overnight, finding a quality cat sitter that you can trust in Camarillo can be a difficult task. That's where we come in. We've spent hours researching to find all of the best cat sitters in Camarillo to help you understand who can help look after your feline friend(s) when you're not around. *If you're a cat sitter in Camarillo and want to be added to this page, please click here. How They Describe Themselves: Our professional and caring team will quickly become your pet’s new best friend! Our goal is to make sure that you feel comfortable, your dogs are exercised and happy and your cats and other small animals are loved and looked after. As a small team of experienced animal owners and lovers, we strive to get to really know you and your pets so we can give personal and loving care to your fur babies. How They Describe Themselves: Our mission here is simple: Make Them Feel Loved! Keep them safe and sound. Provide a sparkling clean Resort. Surround them with good humans. To always treat you and your Pets like family. We pride ourselves in make sure every dog and cat is social, healthy and happy. How They Describe Themselves: Whiskers is about providing the kind of care you give your pets, down to the last detail. That’s why I started the business and why I hope I’m always growing Whiskers! 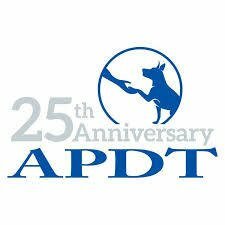 ​Whether you are just embarking on a dog training career, a seasoned industry veteran, or just trying to decide how best to add a dog to your family, the APDT (Association of Professional Dog Trainers) is where you will find the advice, support, and training you need.